This fin delivers! Local central Cal.Sailor John Drab excels in trick and rapid transition sailing. The JD Wave has what it takes to get back on a plane. The full area of this design compliments the short, wider freestyle wave boards. Perfect for boards in the 70 to 100 liter class. This is a weed fin and surf sailing fin rolled into one.Grass and moderate weed conditions will not hold this design back. The concept is a very raked back surf fin. As long as the wind is at least 12-15 knots, this fin will perform! Freeride boards in the 75-110 liter range are a perfect match. The SX is a great choice for the 80-110 liter freeride boards. With a �get up and go� kind of feel and smooth transitions, it can also be used as a freestyle fin. The SX is a good choice for light-wind surf sailing. With a flexy tip that allows for maneuverability yet constant control, the Enduro will give you the freedom and confidence to push your wave riding further than ever. This Freeride design blends the speed of a slalom fin with the looseness of a wave-oriented design. This fin excels in river, lake, or bay sailing. Suitable for boards in the 8ft 4in -9ft 2in range. Very forgiving. The Enduro slotted wave fin is for those wild conditions when all you want to do is stay in control. A slalom fin for moderate to high wind conditions. Notable for its speed and control, this timeless design loves smooth conditions. A moderate wind slalom design for boards in the 115 plus liter range. 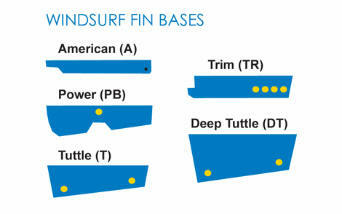 This is a great all around fin that will cover a broad range of uses and exhibits very user-friendly characteristics. Upwind or off-wind this fin maintains control. This weed fin targets light-wind conditions, heavier sailors, bigger boards, and shallow water. It is designed to plane early, and it�s progressive rake allows riders to cut through the kelp and glide in the holes. Use in moderate weed conditions. A pure bred race design. This is a high aspect fin designed for course style sailing where upwind performance is necessary. A very fast fin for the sailor who does not want to forfeit any speed on the race course. Our best choice for an all-around weed fin. With a constant 45 degree rake, the blade weed will shed the harshest weeds out there. The power and tuttle base fins are set forward to accommodate the center of area for more traditional upright fins. 5 degrees more vertical than the blade weed, the S.B. weed is for the sailor who desires to have upwind performance while maintaining the ability to shed weeds. This fin is intended for light to moderate weed conditions. Best for sailing in shallow water bays or lakes and ideal for learning, this low aspect design allows for early planing. Suited for wide-style boards.